I love this serving tray from the Bartlett Spring Mineral Water Resort in Lake County, California. This particular serving tray says San Francisco, however, that location was simply a depot where the product was sold in the city. 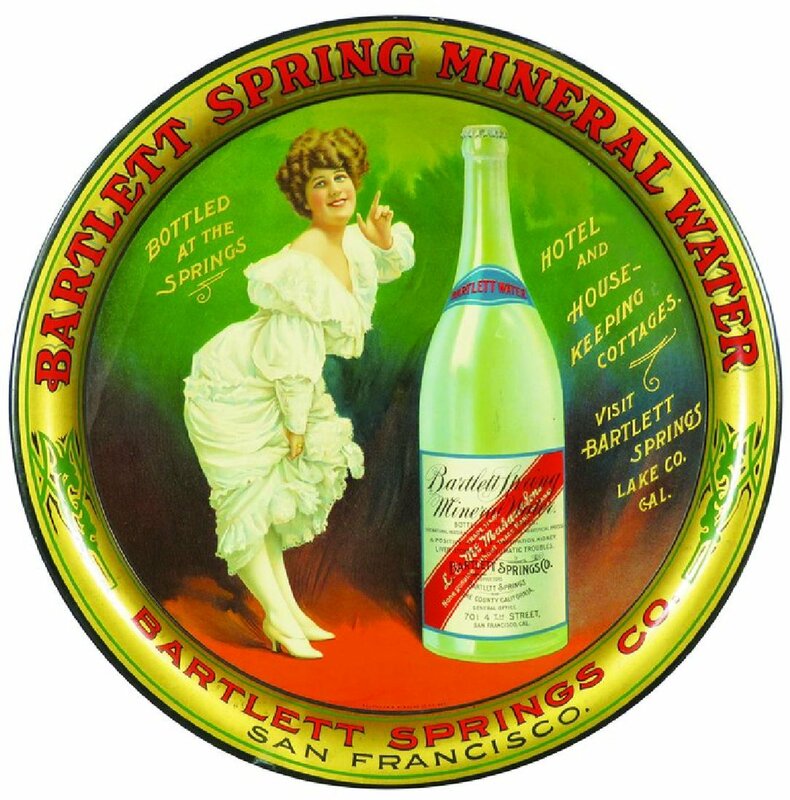 The mineral water was actually produced and mainly sold in the Lake County area, which is approximately 100 miles north of San Francisco in the present day wine country. The serving tray refers to the Bartlett Springs Resort having both a hotel and rooming cottages. A bit of quick research shows the resort had 350 rooms at one time. Today there is nothing left from the resort other than some rock foundations and a pavilion. Fortunately many early photos remain from the resort and show just how impressive the business was at one time. I am anxious to someday visit and simply imagine what used to be. Lake County’s mineral springs resorts flourished in popularity from the 1870’s until World War I, but the crowds began to taper when the Ford Model T caught on in the early 1910’s. The widespread use of the automobile fundamentally changed the way people vacationed. When highways didn’t pass the resorts, people weren’t willing to go too far off the highway to vacation. That kind of rang the death knell for these resorts, as reported by a local Lake County CA historical expert. The Bartlett Spring Resort was described in 1894 as one of the greatest natural sanitariums in the world listing first-class hotels and cuisine prepared by experts of significant reputation. Today the memories of the business live on in trays such as this one, given out to the local trade to help sell their mineral water product.